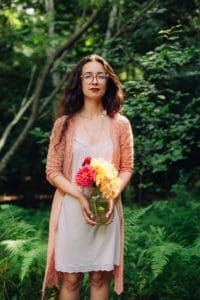 Cassandra de Alba is a poet living in Massachusetts. Her work has appeared in The Shallow Ends, Underblong, Big Lucks, and Smoking Glue Gun, among other publications. Her chapbooks habitats(Horse Less Press, 2016) and ORB (Reality Hands, 2018) are about deer and the moon, respectively. She is a co-host at the Boston Poetry Slam at the Cantab Lounge and an associate editor at Pizza Pi Press. You can find her online at www.cassandradealba.com. Alice Radin has been making poetry since before she could read or write. Despite various distractions (earning three degrees in Comparative Literature, teaching Ancient Greek and Latin, and publishing scholarly articles and short fiction) she has never stopped writing poetry. She can be found on the first Wednesday of the month at the Portsmouth Hoot.